RBTH presents a selection of views from leading Russian media on international events, featuring a report on a new set of sanctions to be imposed by the EU against Russia, specifically targeting Crimea, as well as news of obstacles to the new round of Minsk negotiations on Ukraine and the establishment of a special tribunal in the Ukrainian parliament to investigate the crimes of the previous regime. The European Union is planning to launch another package of sanctions against Russia on Dec. 15, the tabloid newspaper Moskovsky Komsomolets reports. The EU will toughen sanctions against Crimea, which can expect limitations on European investment. In addition, Europe plans to ban European citizens from financing or acquiring Crimean commercial structures. Restrictions will also be imposed against European companies running tourist businesses in Crimea. According to Moskovsky Komsomolets, the new sanctions are connected with Europe’s concern over the situation in eastern Ukraine. The measures will also serve as the EU’s response to Gazprom’s intentions to develop oil and gas off the shores of Crimea. The EU has already prohibited imports from Crimea without Ukrainian certificates. 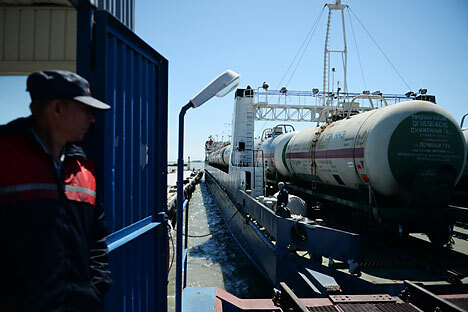 It later banned investments in transport, telecommunications, and energy infrastructure projects on the peninsula, as well as the development of Crimean oil, gas, and mineral fields. The Kommersant business daily reports that the new round of Minsk negotiations on Ukraine is in jeopardy. On a recent visit to Moscow, French President Francois Hollande acted as an active mediator in getting the parties to agree to a new meeting of the contact group. However, the new talks never happened because the delegates from the unrecognized Donetsk and Lugansk people’s republics in the Donbass region of eastern Ukraine disagreed on the date and the terms of the negotiations. This resulted in a “war of the nerves,” in which the parties accused each other of not wanting to come to an agreement, Kommersant writes. The rest of the members of the contact group met in Kiev instead of Minsk, placing responsibility for the pause in negotiations on the breakaway republics. For these reasons, former Ukrainian President Leonid Kuchma, who is representing Kiev at the negotiations, has called the usefulness of a new meeting this week into question. Head of the Donetsk People’s Republic Alexander Zakharchenko has made it clear that Donetsk has no need for negotiation for the sake of negotiation. Commenting on the prospects for a third Minsk meeting, he warned that the republic will seek clear guarantees that the agreements – including the agreement on a ceasefire – will be fulfilled, Kommersant reports. The Nezavisimaya Gazeta daily writes that the Ukrainian Security Service is initiating the establishment of a National Tribunal in the country’s parliament, the Verkhovna Rada, to investigate the crimes of the previous regime. The Security Service wants to create a structure that combines the investigation of all criminal cases, including the embezzlement of public funds, crimes against the participants in the Maidan movement, involvement in the annexation of Crimea, and participation in fueling the conflict in the Donbass. At the moment, 22 people in Yanukovych’s circle and the ex-president himself are involved in these cases. The newspaper reports that those responsible for the shootings in Kiev and for burning the Trade Unions Building have yet to be found. People have also started to stage new protests in honor of the anniversary of the Maidan events, accusing General Prosecutor Vitaly Yarema of idleness. It was against this backdrop that the idea of establishing a National Tribunal was born, Nezavisimaya Gazeta writes. Some experts say that the authorities are trying to divert society’s attention away from the country’s economic problems by starting up a loud initiative. “That’s not true,” Director of the National Democratic Institute Serhiy Taran said. “Right now society is putting enormous pressure on the authorities, demanding punishment for all of those guilty for the shootings on the Maidan, for facilitating the annexation of Crimea, and for the destabilization in the Donbass,” he said. In Taran’s opinion, the business structures belonging to officials who fled the country are still operating in Ukraine, are participating in tenders, and continue to get funds from the state budget, which is upsetting the population.